Coming June 23 or September 8, 2012. 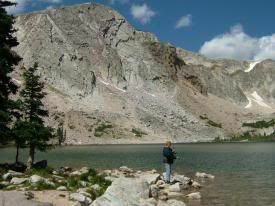 Yes, women like to fish too, especially when there’s beautiful scenery and a good TrailblazerGirl friend along, and you can bet the picnics we bring along are a lot better than the guys. But, there are few courses geared for women, so we’re happy to present these 1-day Intro to Fly Fishing courses by The Women’s Wilderness Institute in Boulder, Colorado. You’ll not only learn all the beginner skills including how to set-up your rod and reel, tying knots and the basics of catch and release fishing, you’ll also be provided with all the gear you’ll need, so this is a great opportunity to get introduced to an activity you’ll be able to enjoy for your entire life.